← How To: Keep Your Lips Hydrated and Healthy! Hi Beauties! I’m SO sorry I haven’t posted in a couple of days! Life has been fairly hectic for me with school and sports and other things in my life! But, I’m back now, and here to talk about an item I have been OBSESSED with lately (literally, obsessed!) That item is Benetint by Benefit, so here is my review for you all! BUT FIRST: Stila is on HauteLook! They’ve got some CRAZY amazing deals, like full size eyeliners for $5, and their ever-famous Smudge Pots for only $10! They’ve got eyeshadows for $6, and a ton of other amazing amazing beauty products on sale! Tweezerman is also on HauteLook today, and have some AWESOME brow kits! I got one of their brow kits, and can’t wait to get it! 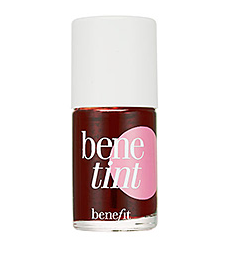 Benetint By Benefit, $29 at Sephora (http://www.sephora.com/benetint-P1272?skuId=108779) is a rose colored lip and cheek stain. 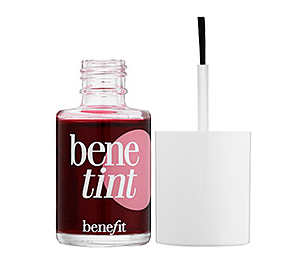 It is a bright, subtle, warm rose color that is flattering on almost all skin tones. It is used for the lips and cheeks, and look stunning on both! On my lips, it is a darker rose, and on my cheeks it is a light rosy pink. There aren’t enough good things I could say about Benetint. I am in LOVE with it basically, and with the natural flush of color it gives my face. It looks completely flawless, and doesn’t streak (although you need to apply it fairly quickly to avoid streaking!) The color is STUNNING, and not overpowering. It brightens up your complexion instantly, and on some days, is the only makeup I wear. It’s easy to apply, and it smells like roses (major plus!) I cannot fully express my love for Benetint. Initially, I didn’t want to buy it, because $29 on a lip/cheek stain was a tad outrageous. But once my friend Alissa would not stop RAVING about it, I figured I had to try it, and now I know what she means! I absolutely recommend Benetint, it deserves 10 billion stars! So there is my review! In the comments, tell me if you’ve tried Benetint, and what you think! Hope you enjoyed! where can i buy the stila eyeliner? sephora?